Mindful use of digital media means thinking about what we are doing, cultivating an ongoing inner inquiry into how we want to spend our time. 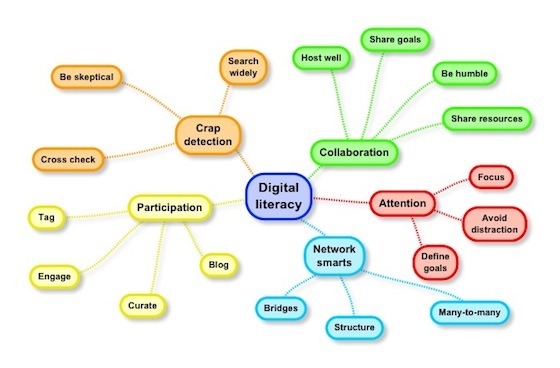 I outline five fundamental digital literacies, online skills that will help us do this: attention, participation, collaboration, critical consumption of information (or “crap detection”), and network smarts. I explain how attention works, and how we can use our attention to focus on the tiny relevant portion of the incoming tsunami of information. I describe the quality of participation that empowers the best of the bloggers, netizens, tweeters, and other online community participants; I examine how successful online collaborative enterprises contribute new knowledge to the world in new ways; and I present a lesson on networks and network building. I’ve pulled a few words around the five literacies into a little mindmap to provide some additional flavour. I’m sure I’ll blog more about the book later, because it has so much wisdom about how to make the most of the amazing new communication tools we now have, without being swamped. And much more. For the moment I just want to reflect on how it helped me shift the perspective I had in my previous post about The challenges of networking civil society as joining up social spaces, into the challenge of developing digital literacy, and supporting people in the networked world. Despite quoting extensively from Tim Davies on the danger of focussing on platforms (blogs, Facebook, online forums) rather than culture and capacity, I did bang on a lot in my earlier piece about how better to connect the various online spaces serving community activists, so they could find information, communicate, collaborate. While I do think that would help, a few conversations that I had after I posted the piece made me feel it would be difficult to achieve. I was reminded that the various online spaces reflect different interests, approaches and business models. There probably isn’t enough incentive to do things differently … because the user/customers don’t pay, the funders probably won’t do much nudging, and volunteers have enough to do maintaining current activity without negotiating new arrangements. It’s tempting to go for Baroness Newlove’s one-stop activist hub, but that’s not going to work any more than one newspaper, magazine, TV channel, bookshop would serve our very varied needs. On the one hand organisations (and individuals) need to be more skilled and thoughtful in the way that they publish and communicate (PLEASE … no more 50 page pdf reports … you know who you are). And we all need to be smarter at listening, engaging, collaborating online. If funders and agencies are concerned about helping citizens and small groups play a bigger role in civil society, focussing on Howard’s five literacy would be more useful than investing in further platform development. 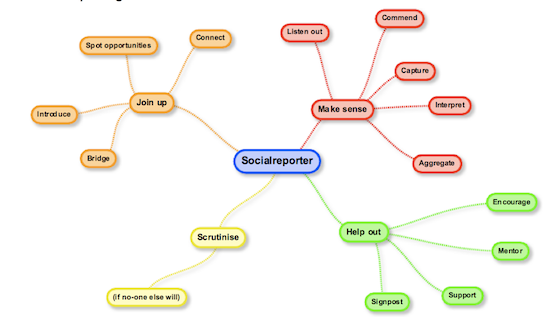 I would argue that we also need the online equivalent of on-the-street community builders, so I’ve also dropped in a mindmap of about social reporting that I’ve used before, with some video. You might argue that talking about digital literacy for community activists may be rather premature when actual use of technology is pretty unsophisticated in most community groups. There’s a case to be made … “why bother”? On the other hand Howard’s points about staying focussed, engaging, collaborating are as much about attitude as tech … and should make sense in any setting. I think crap detection will strike a chord as well. Posted on March 6, 2012 by david wilcox. This entry was posted in All posts, collaboration, social reporting and tagged digitalliteracy. Bookmark the permalink.